Would YOU like to get paid while watching the hottest concerts and Detroit sporting events? How about standing with 25,000 cheering fans at a Red Wings game? If you want to be a part of the excitement at the new Little Caesars Arena and the vigor of a growing reputable company...come join our Team!!!!! Sitting or Standing for extended periods in variable conditions. Capable of working independently in multiple settings (indoors and outdoors). Demonstrates the ability to work as part of a Team. 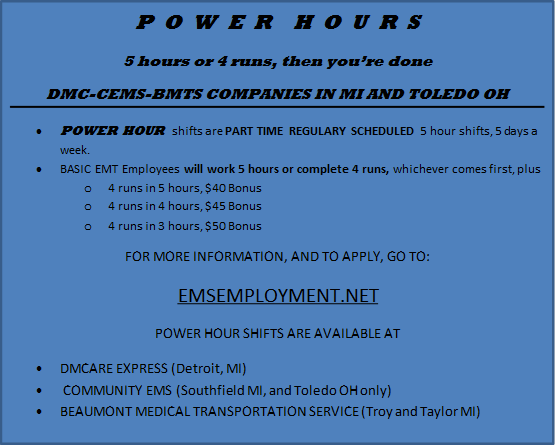 DMCare Express is a Joint Venture partnership between the Detroit Medical Center and Community EMS of Southfield, MI. Our board of directors includes representation from several hospitals and medical transportation services in the area. We are proud to provide services to communities and businesses in the Metro Detroit area. We have been the official service provider to The Detroit Tigers and The Detroit Red Wings for many years. Furthermore, we recently entered into agreements with Rock Ventures to provide fast and reliable emergency services to several Downtown Detroit area businesses, such as Rock Financial, Compuware, DTE Energy, Comerica Bank, and Blue Cross/Blue Shield of Michigan. At DMCare Express, we take great pride in being accredited by the Commission on Accreditation of Ambulance Services (CAAS). CAAS was established in 1990 to specifically set the “Gold Standard” within the ambulance service industry. We can also proudly affirm that our Parastar dispatch center is recognized as an Accredited Center of Excellence (ACE) for dispatch services by the National Academies of Emergency Dispatch. Not only is DMCare Express the only Detroit based agency which holds CAAS Accreditation, but we are one of only 152 organizations with this accreditation nationally. Additionally, only 23 agencies worldwide hold both CAAS and ACE accreditations. Our corporate goals are quite simply to be the best in our practice and a trusted resource to every patient by providing competent, safe, and efficient care. We go the extra mile to ensure that standard of excellence is maintained with each patient. DMCare Express , Inc. is committed to providing an array of high quality, health related services of social value by conducting all operations in an atmosphere of concern, respect for human dignity, legal and ethical responsibility, and efficient management of health care resources. To provide HIGH QUALITY, COURTEOUS< TIMELY and COST EFFICIENT emergency and non-emergency treatment and transportation to the DMC and other health care organizations, municipalities and the general public. DMCare Express accepts Visa, MasterCard and Discover as payment methods for online payments. To make a payment, please have your run number and card ready, and click on the button below to be directed to our secure payment portal. Attention Michigan EMT's, fast track your Paramedic Certification with free training from LSTI! DMCare Express is looking for AWESOME EMT's to join our professional team as Paramedics! For a limited time, DMCare Express is offering EMT-Basics of all experience levels to get PAID to attend class, PAID to work, and have their entire tuition PAID...FOR FREE! Click the link below to read more on the program and apply online today. Hurry, this offer ends November 15th and available to the first qualified EMTs! DMCare Express is NOW HIRING Part Time Paramedics for Road Deployment & Special Events. Would you like to join a reputable team of professional EMT’s and Paramedics? How about working a Tigers or Red Wings game? Learn more about DMCare Express Careers. A Physician Certification Statement (PCS) is required, pursuant to 42 C.F.R. 410.40(d)(2) and (3), by the Centers for Medicare/Medicaid (CMS) on all scheduled and unscheduled non-emergency transports. DMCare Express is headquartered just east of Downtown area, and only minutes away from Cobo, the Renaissance Center, the Detroit Medical Center, Rock Financial, the Detroit Casinos, Hamtramck, and Eastern Market. For more information in contracting with DMCare for services to your area or facility, please contact Terrye Nicholls. Copyright 2016 DMCare Express, All Rights Reserved. The DMC logo is a trademark of the Detroit Medical Center. DMCare Express is a joint-venture partnership between the Detroit Medical Center, and Community EMS. Website designed and managed by Parastar, a national a national leader in EMS billing, consulting, management, and EMS support services. Notice of privacy practices. Discrimination Statement.